I've hated Barney on principle for years now, but until now, I haven't actually seen an episode, nor did I know anything about the character beyond the fact he was an annoying purple Tyrannosaurus Rex who sung badly and cultivated the company of young children. But I didn't know, for example, that he was a normal-sized plush toy who gets turned into a not remotely full-sized dinosaur by the children's imagination. Nor did I know that he has similar dinosaur friends, one of which is named BJ. You know, I think the fact that the show's producers couldn't think of a single good reason not to name a character "BJ" tells you a lot about the people who made Barney and their understanding of America's youth. This special starts at the home of one of Barney's friends on Christmas Eve. All her friends are coming over to help decorate and for Christmas dinner. I'm assuming they're all orphans whose parents were eaten by dinosaurs, because otherwise you'd think they'd be spending Christmas Eve with their own families. I should probably mention that every few minutes, someone breaks out in song. And "breaks out" is absolutely the right word: think of the way a rash appears. The traditional Christmas songs used here are horribly adapted, but they're goddamn works of art compared to the original stuff. This pattern continues for the entire one-hour run time of the video. Regardless, all the kids help decorate, along with Barney and the other dinosaurs. Of course, whenever parents step in, the dinosaurs have just stepped out and vice versa. Once everything's ready, someone realizes that while Santa fills everyone's stocking, there's no one to fill his stocking. Obviously, the only solution is to make a ton of crappy arts-and-crafts gifts, then travel to the North Pole via the power of imagination to give them to Santa. There's a snow globe involved, too. So. They arrive at the North Pole instantaneously and proceed to break into Santa's house and cram their garbage into his stocking while he's asleep. They finish just as one of the dinosaurs wakes him by accident. He knows Barney for some reason, and he shows the kids his lists of who's been naughty and nice, then sends them on to the workshop, where Mrs. Claus takes over the tour. The factory tour mainly involves a ride in a train through some sort of CG toy wasteland. There are no elves, supposedly because they're at home with their families. The kids help wrap some presents (I guess the elves' union sent them home once they'd wrapped one billion, four hundred thousand, six hundred and seventy-six of the world's one billion, seven hundred gifts - hey, five is quitting time), say goodbye to Santa, who finds the gifts they left him and thanks them, then head home. After a few more songs, of course. Nothing interesting happens for the rest of the special, but then again nothing interesting happened so far, either. This was tedious, but it was kind of fascinating to watch it flop around pointlessly for an hour, sort of like a fish out of water. 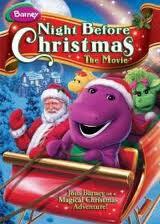 I bet the other Barney specials this one came packaged with will be just as interesting.